You can use any dog-friendly freezable white/neutral base for tinting. I often use yogurt (straight or diluted) for frozen goodies, but opted for reduced fat coconut milk in the pictured treats for variety since I was also making stained glass yogurt treats and I had leftover coconut milk on hand. :) See tips and tricks below for more! 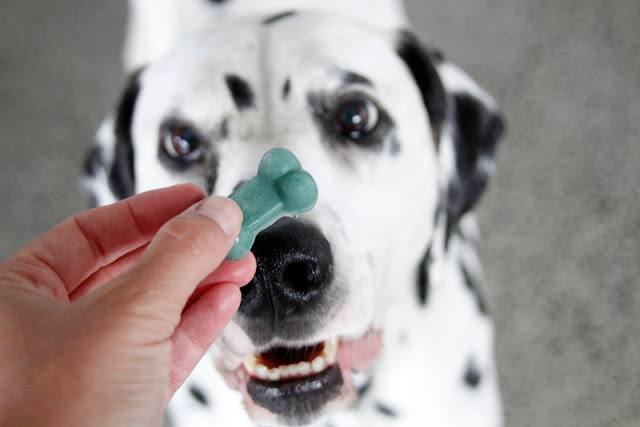 Choose a dog-friendly white or neutral base (see note above) for your pupsicles for best tinting results. Dilute or augment the base if/as you wish for quantity and richness (see tips and tricks below) and then separate into small containers for mixing tints. Add tints (see other colour/tint ideas here) and stir to combine. Some tints benefit from a little time to develop and take on their full colour potential, so work incrementally with some sit-time between additions until you are happy with the colouring. Carefully pour or spoon into silicon molds and freeze thoroughly. Remove your treats from then molds. Quickly transfer the pupsicles into a suitable storage container and return to the freezer until serving. No measurements required - frozen treats are so easy! As noted above, you can use any dog-friendly freezable white/neutral base you'd like for tinting. Depending on your dog and personal preferences, options may include milk, coconut milk, yogurt, kefir, pureed fruit, and more. Want to adjust the consistency of your liquid base? You can bloom gelatin to thicken the base liquid for easier handling (if you're a spilly filler, like me!) and added nutrition. Alternatively you can dilute the base if you want to reduce the thickness of the base for mixing (e.g. yogurt, mashed banana, etc.) or simply to reduce the richness of the treats. Flexible silicone molds or ice-cube trays work great for making fun little shaped treats. If you want a precise measure of a specific mold's capacity, you can do a test pour from a measuring cup of water to measure the volume required to fill your tray. For easy for handling between filling and the freezer, I like to place my molds on a portable flat surface, like a cutting board, before filling. Frozen treats can melt quickly. If you are unmolding treats in warm weather (or warm ambient kitchen temperatures) it can be helpful to have a chilled plate to place them on as you pop them out to reduce messy melting before transferring to your storage container. Store and serve straight from the freezer. 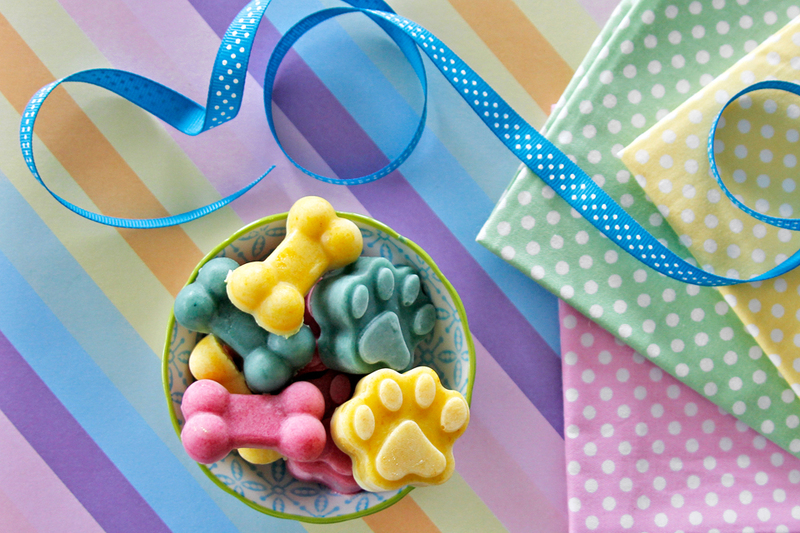 Frozen treats will melt quickly, especially in warm temperatures and can be messy while your pup is licking merrily, so these are best enjoyed from a bowl or outside.